On Being A Rainbow — ZariAlyssa. I ran across this image on Tumblr last week and it made me pause. 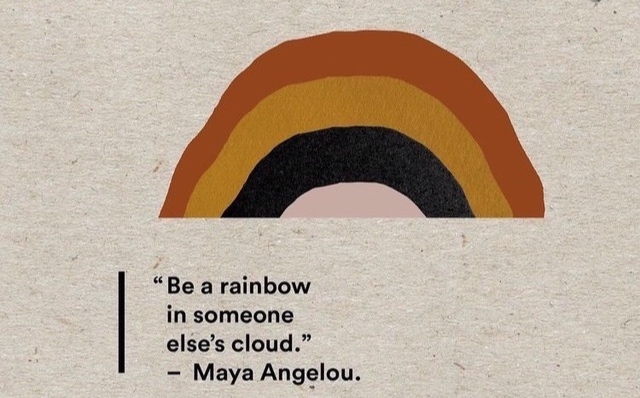 It’s a quote by Maya Angelou that reads “Be a rainbow in someone else’s cloud.” Whether or not Maya Angelou actually said it is questionable but I won’t be a cynic. The premise of it is very simple — be positive. Being positive all the time can seem impossible at times. The train is delayed and you’re late for work. There’s an obnoxious costumer that is giving you problems. The car in front of you won’t stop stepping on the breaks when the highway is clear. Any of these daily annoyances can easily change your attitude and put you in a bad mood, vulnerable to lashing out on those around you. A bad mood can stick with you the entire day. You’ll be walking around in a dark cloud. When someone’s in a bad mood, you can feel it in their aura. If you’re experiencing a “cloud” and act out of pettiness, anger, jealousy, or any other negative emotion, it will spread. It’s easy to be petty when someone is petty first or react in anger when someone gets you upset. This is no personal fault of ours, it’s human nature. A lot of times, talking about positivity can get feel very surface level. Saying “positive vibes only” and having a poster in your room with those words can do nothing to change our behavior in reality. It’s definitely easier said than done. Like anything else in life, it becomes easier through practice. Practicing positivity is the only way that it will become a learned behavior. Some ways to practice positivity include feeling good about yourself, not letting the attitude of others change your positive outlook and encouraging positivity in others. You can’t be a source of light for others if you don’t start with yourself. Work towards feeling good about yourself everyday by thinking about what you’re grateful for or saying affirmations out loud. The love you have for yourself will spread to others. Once you have a good outlook, it’s annoying when people’s negativity starts to enter your space. Being around bad energy can be contagious but letting their bad mood put you in a bad mood doesn’t benefit anyone. When friends are in a bad mood, they may want to wallow in self-pity or talk down on themselves. These behaviors may feel good in the moment but the gratification doesn’t last long. Encouraging positivity, especially when it’s easier to be negative in the moment, will surely improves the moment and make it a positive one. Remaining positive is a habit and ultimately a lifestyle choice. It begins by making small decisions everyday to only embrace good things like joy and happiness. It’s most important when it’s during a moment of negativity. We never know what someone else is going through so remember not to take anyone’s negative behavior personally. Being a source of light during someone’s darkest time can mean a lot to them. It can change someone day for the better.Reacting to negative energy with positive energy kills the spread of it. It’s hard to others to be in a dark cloud when you are exuding light. “You are the light of the world. A city situated on a hill cannot be hidden. No one lights a lamp and puts it under a basket, but rather on a lamp stand, and it gives light for all who are in the house. In the same way, let your light shine before others, so that they may see your good works and give glory to your Father in heaven.